Edition Mono/monochrom, 96 pages, 2016. The catalogue presents a first overview of the work of the Vienna based artist Silvester Stöger. In the last years the media artist, who is strongly influenced by digital cartography, is focusing on ink drawings, although the context is changing and the surface of his images becomes more and more abstract. Repetitive structures refracted Op Art, sober psychedelics. Among numerous illustrations the catalogue includes a conversation between the Munich based curator Viktoria Wilhelmine Tiedeke and the artist as well as a poetic text from the Viennese author Thomas Ballhausen, who opens the work literary associatively for further interpretations. In the summer of 2015, Silvester Stöger presented his work at the exhibition “Kistalline Topographien” (“Crystalline Topographies”), curated by Viktoria Wilhelmine Tiedeke, at the super+ CENTERCOURT gallery in Munich. The dialogue presented here is based on the artist’s discussion in Munich. You studied Multimedia Art at the University of Applied Arts Vienna. Did you make a conscious decision to study with Erwin Wurm and do you recognize this as an influence in your work? I graduated in 2009 from Erwin Wurm’s class, but I actually started my degree in the class of Bernhard Leitner, which had a strong focus on experimentation with media such as sound, video and installations. That’s what I was interested in. Only later on was the class taken over by Wurm, which changed both the structure of the class and its direction. For me, this change of professors mainly created space to not only explore new artistic methods but also to apply my questions directly to my own environment. That is why I decided to do an extended stay in Belgrade as well as an internship in art education at the Generali Foundation in Vienna. Both experiences broadened my horizon in a way that university couldn’t have. For the development of my own artistic expression, personal reflections on what was in my immediate contact zone became more pertinent. The explicit curriculum at university became less important. Nonetheless, the class certainly shaped me, but not more so than other factors. I would resist being characterized as a Wurm disciple. What convinced me about your work in our first conversation was the successive rigor that leads you from one question to the next. How did you end up working with cartography, what was the appeal for you? Maps have always fascinated me. There’s something about travelling, about visiting other countries like in a dream. Later on, I was interested in the process of reading maps; on the one hand, their legends as an aid in correct interpretation, on the other hand, the possibility of errors and inaccuracies. I started to work artistically with the topos, because I became more and more interested in the construction of our perception, in particular through maps and models. In the same way that any tool will focus our view on things, a map is fundamentally determined by the intentions of its creator. At the same time, our orientation is influenced by the maps we use. Similar to a cybernetic feedback loop, we create tools with which to make the world visible and with which to then perceive it. In doing so, the perspective we create and which we build into our tools leads to a feedback loop. Every visualization, like the view through a magnifying lens, always also implies censorship. That’s how I ended up working with a kind of contemporary, computer-assisted, networked cartography, namely with the software Google Earth. In reference to the above-mentioned construction of our view of the world, I deconstructed the available satellite images into their component parts with the aim of constructing something new. Ultimately, the works I have created are about the artificiality of our world view. So you question the documentary aspect of Google Earth and, in a second step, documentation’s ability to represent. When we travel to a new region, we let ourselves be guided by a map, we trust its accuracy. Is it this putative objectivity and accuracy that you question? Well, a certain accuracy of maps is verifiable through experience and can only be disputed to some degree. Nonetheless, a map is never objective and exact, it is an artefact of the mind that perceives the world. That is why the illusory aspect of Google Earth fascinates me. A satellite image that lets you fly across the whole world endlessly, putting the world at your feet, but only in a would-be way, as you said. In fact, we merely are consumers of a subjective illusion and therefore impotent. A map always has a purpose and is never a representation of ‘reality’ in its entirety. A complete aerial view of the globe ostensibly serves as way to orient ourselves, but it also conveys a feeling, a lifestyle. To have everything, everywhere, at any time, to think ourselves omniscient. Both are symptoms of globalization and are intimately connected to Google’s business model, with which we perhaps increasingly identify and the perspective of which transfers to us. Your answers seem to hint at a strong ambivalence between fascination and rejection. How does this manifest in your artistic work? I addressed these topics both in the series “Stadtfragmente” (“Urban Fragments”) and in the three big panoramas “Tokyo”, “Melbourne” and “Seattle”. They were meant to be somewhat uncomfortable, perhaps even critical. The motifs grow like tumors in dystopian formations or remind us of microscopic images. Seemingly exchangeable pieces of a puzzle belonging to a bigger unit. These works are digital collages made from various Google Earth images – thus, photographic fragments such as houses, trees and parts of streets – that were arranged and composed in a way that created a new urban surface. Like a remix in music. The method might raise questions in regard to the places and their history or the shape of these newly created landscapes and the totality of things that is imparted through them. It was mostly this second aspect that interested me, the variable shape of the appearance of the real. So in your work, with your creative method and the way in which you deal with graphical material, you take your critique of the perception of Google Earth to the extreme. Yes, from the graphical material – the illusion – I created a further, even more artificial representation of it. But with this potentiation I revealed the illusion, since it became identifiable in details like incorrect perspectives and shadows. It is important, however, that I didn’t exclusively want to treat Google Earth as an issue, it merely constituted a contemporary tool to work with in order to express my general critique of perception. These early works you are talking about have a certain ornamental appearance. They seem to me almost like frightening utopias of excessive urban planning. Is the critique merely of a formal nature or is it also political? At the time, it was a very open critique, primarily on a formal level through an exaggerated expression in regard to urban planning. It was meant as a demasking of construction. Later, in the “Fortress Europe” series, the collages became explicitly political. The background of these digital collages was the European border politics their title is based on. The causes of migration flows in the current global world order are complex interrelations of economical and social conditions and the wars resulting from these conditions. Rich developed nations simplify these connections in their official declarations in order to gloss over their own complicity in the dominant neoliberal (economic) policy. The paralyzing feeling you get when observing the current political developments, in which humanitarian and pacific matters are of no concern, is absolutely sickening. The motifs I created back then were meant to pursue this, to reveal our position, to show how little we know. Despite the fact that we can access information more flexibly than ever and that we can use an interactive super-world-map, we hardly know anything about the people who are affected, their fates or the circumstances of their migration. I wanted to illustrate this by creating textures from houses in regions that were hotspots on Europe’s outer borders at the time and where a multitude of bloody border crossings had taken place. Thus, the works are political, but they offer no solutions and make no demands. The thematic interest led to a desire to demonstrate the limitations of perspective: by varying the visual material, by combining it and thereby exploring its free, aesthetic and creative potential something new emerged, something I would perhaps call an experiment in political ornamentation. Mainly also to personally process these issues. Have you also explored schematic big data visualizations? Where would you place yourself – does your work belong into the large category of big data art? To be honest, at the time of creating these works I hadn’t heard of big data. But the path from cartography to statistics and data visualization suggests itself and these are topics I was already interested back then. This is most apparent in the newer drawings. In contrast, the urban utopias are reflections on the software Google Earth, which, with all its user-generated content and its large number of users, serves as a kind of a harvester for big data. In addition, I would count the production of insight through big data collection among the human structures and forces that interest me. Nonetheless, I wouldn’t call myself a big data artist, that would demand a mode of working including data sets and algorithmic analysis. Is cartography actually the right term or do you prefer topography, like in your exhibition title at the super+ CENTERCOURT? What is the difference? In the last few years, the cartography in my works has transformed into topography. Previously, reflections on maps were really the main focus. The path led from road networks to relief representations – if you want. What is left is mostly the structural notations in the wider sense. A map primarily aims to convey knowledge, as does topography, which is really a variation of cartography. However, in topography, what explicitly becomes evident as relief representations are bucklings that were created over millions of years, for example through tectonic plate movements or volcanic eruptions. In comparison, these forces dwarf human activity in or on the landscape. I am more and more interested in such forces, shaping not only tectonics but interrelations in our world in general. Both in nature and in the human dimension. For you, topography is organic, in contrast to the digital representation of cartography – today, your works are analogue, graphic and have also grown organically. Was this shift in media attended by the shift from cartography to topography? There certainly is a concurrence. When I started drawing, the notion of cartography was still relevant. The more organic characteristics of the new medium later suggested the notion of topography as a better description of my reflections. And how about the shift in visual content, in representational potential? In your earlier works you used cartography as an opportunity to take a stance, whereas you now create quite unfettered situations. These are only formally based on hatching, using the line as a formal principle, but are otherwise completely independent. I think that the release from this narrow contextual framework was very productive for my work. Whereas I previously reflected on these limiting perspectives and put them at the centre of collages, I began to increasingly experience them as obstructive. In retrospect, can you name a crucial impulse for your current, filigree drawings? This development was the result of several factors: mostly it was the fact that after working on the computer for so long I wanted to do something with my hands and to stop sitting in front of a monitor. I experience the ubiquitousness of computers in our lives as very exhausting. Then I rediscovered the metal ink pen, which had fascinated me as a tool since schooldays and which I was keen to try again. The joy of dipping into the ink pot, drawing a line and watching it dry has kept me spell-bound over the last few years. So I would say that drawing itself has become very important for me, the engagement with each sheet of paper and the different work steps that are necessary to finish it. An essential component of the drawings is an ever expanding texture of lines, what is that about? The beginning of these structures, which undoubtedly are a central theme in my current drawings, was initially an interpretive measure. After the “Fortress Europe” series I wanted to broach the subject of the political border per se. I chose the national borderline as a main motif and filled the rest of the image with texture. Its regularity wasn’t intended. Rather it was an attempt to depict a field from an aerial view, since in Central Europe border regions are often agricultural land. The parallel lines of fields quickly became abstract and developed into a kind of hachure as it is used in maps. In this sense I used it as a central element of meaning – as if it was land. Region, area, land or the humans that live in it. I would describe this idea as the rest of a political impetus. In the end, the texture developed a life of its own and took an almost crystalline form. However, the suggested regularity is an illusion, it is always broken upon closer inspection, it doesn’t actually exist. Geometric structures then developed as an additional element. In the series “Impact Distribution”, markings on the planar texture were connected through lines to form inscriptions. The title describes the point-shaped forms as well as their connections. The schemas that develop are evocative of the illustrated spaces, but the more recent works increasingly explore the image space per se. Thus, the border is no longer an illustrated motif but becomes an image-immanent constant that is particularly evident in the multi-part nature of some works. Finally, to ask about the most recent term you have used for your drawings – as well as in the book title – what are “organic machines”? I use the term, or the notion, “organic machine” since the schemas I introduced in “Impact Distribution” have seemed increasingly mechanical to me. As if it was joints and arms in the kind of constellation of tension we called tectonics earlier. They put tension on the texture in the background, which spans around the mechanics like a membrane. From this perspective of a formal “interaction”, the “Organic Machines” are a further development of the “Impact” series: their relationship to the background has proven to be an active one. “Organic Machines” is meant to emphasise that it is always about interrelations and systems; equilibrium states that immediately react when a variable changes. This is equally true for single organisms, ecosystems, societies and economies. You directly connected the beginning of your practice of drawing with working on the computer. What potential does the analogue have in contrast to the digital? What necessitated the step and what did you find in the analogue? Apart from the reasons I have already mentioned, I have been interested in using a very simple method to produce something that is influenced by all the realities of, and occasionally thoughts on, the digital world we live in, but that isn’t created with its tools. Particularly in coming from a digital method of production, it was fascinating to examine my drawing in this respect. Even if now it is my hands instead of the computer that produce something, all memories subconsciously go into what is produced. For instance, it seems to me that there’s an aesthetic of automatisms in the drawings, like the algorithms in generative art, but I don’t intentionally strive for this aesthetic. Another example for the potential of manual production is human error. If we make a mistake or don’t like the outcome while working on a computer, it is very easy to go back and repeat the process or to make changes. If something goes wrong in an ink drawing or the results don’t live up to expectations, we either have to accept it or start from scratch. I like that, but of course only as long as the question occurs at an early stage of the work. Inaccuracies are similar. The results of the computer are exact. 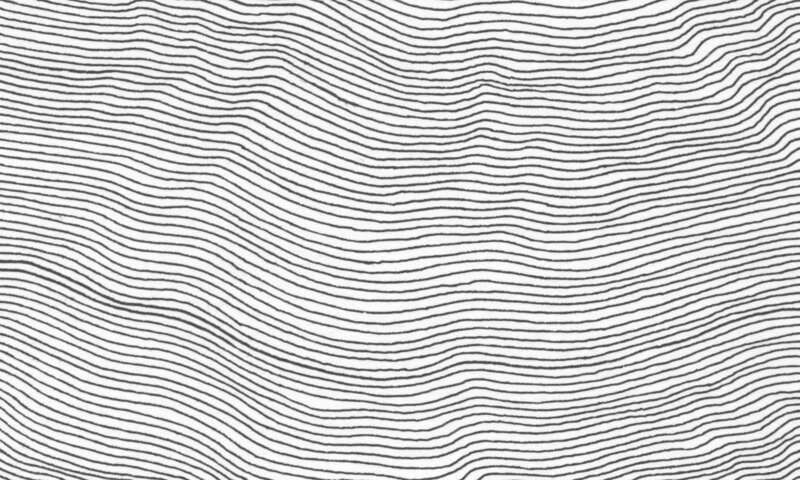 For instance, every line is completely parallel, whereas drawings by hand always show some deviation. One day your hand is more stable, another day you struggle with concentration. But it is only through these inaccuracies and deviations that the drawings become organic, that they come alive, as if they were vibrating. Besides, this is how I allow myself some freedom, a failure that is inherent in the experiment. To train myself in the acceptance of mistakes is very liberating and enjoyable. Especially since nowadays we submit ourselves to a high degree of self-discipline and self-optimisation. This is an exercise that I would hardly be able to do if I was working on a computer. How do you go about drawing? Do you have a composition in mind in advance? Only partially. I certainly have a general idea of what I want to do and what I expect of the results. I give myself something like a rule that I have to follow for each drawing. Nonetheless, a large part is only decided during the process or is left to chance. Starting with the “Impact Distribution” series, I first drip ink on the paper, a more variable act that nonetheless already has my movements impressed upon in it. These points are subsequently connected to form structures. I then fill the rest of the sheet with a texture according to the rules I have mentioned. Is temporality or another real parameter of our sphere of experience a factor underlying your works or are they free of it? Time is absolutely a factor in the drawings. While executing the texture, more time passes depending on the size of the sheet, in any case it isn’t a fast process. Quite the opposite happens and the process of drawing becomes monotonous in its repetition. Sometimes it is almost meditative, since the repeated drawing of parallel lines of course requires close attention and there is little room to think of other things. With really fine lines even unchecked breathing influences the result, as the body moves ever so slightly with every breath, like a seismograph of one’s own condition. Some works have narrative or figurative titles without mimetically representing them. What is the relationship between content and form? You are right that, for me, giving titles to my works is not so much a description of what is represented. Rather the title offers a clue for interpretation. Yet, it’s not about one correct reading, that doesn’t matter so much to me. I also doubt if there is something like a “correct” meaning in the drawings. I use the titles to create a framework for the discussion of the drawings. For, in spite of seeming very abstract, they represent something for me, even if in a very wide sense. Perhaps one could describe your topographies as “situations”, as a kind of personal mind map on the actual and conceived context that forms the basis of a given sheet? That would imply a certain narrative. Do your works therefore have an inherent chronology, a chronology of perception? I like this comparison. The terms I use, such as tectonics, interrelations, forces etc., could equally well be called “situations”. As you say, I have a context in mind that I might not be able to specify precisely, but which I try to express in the drawings. The results are mostly abstract. With the implications that I have in mind, something is represented after all, something is narrated. That’s also what I like about exhibitions, when visitors approach me who associate a lot with the works and create their own narrative. These narratives are alien to me, but they are justified purely based on the fact that they were evoked. The way I see it, chronology of perception is a good description of what happens when the drawings are received. The observer quickly finds himself in a shifting interaction with habitual viewing patterns. The gaze wanders across the surface, just as in looking at a map, it is being guided by patterns, connects them into structures. Again and again the gaze drifts off to the flickering texture and searches it for discernible forms. Then the planar texture comes to the fore and becomes an important element of the picture. One tries to see representative forms or patterns, which is destined to fail. Nonetheless, the gaze again catches on a form. There is more of a synchrony than a chronology, an again and again of the gaze. It is this process of perception that I allude to with the title “Alle guten Dinge sind unendlich” (“All good things are infinite”), in which two closed looped structures form the central part. Apart from your artistic activities you are also a professional film restorer. Could say at the moment that one aspect was more important than the other? I’d like to give a quite unromantic answer. In a world of precarious employment it is necessary to pursue several activities, therefore both aspects are very important. A preference always depends on the perspective. Art satisfies a personal urge to produce manually, to follow a process of creation and to express myself. In my work as a film restorer, I am fascinated by both the engagement with historical film material and the images and stories that have been captured on it as well as its migration to the digital sphere. Where in your work do we encounter Silvester Stöger, the film restorer, where Silverster Stöger, the free artist? Since I frequently work with archives, I prefer to work with analogue material that is stable or at least is only exposed to a physical decay, that isn’t ephemerally stored on a magnetic medium. I enjoy being able to hold art in my hands. Furthermore, the question arises what the choice of storage media for cultural goods tells us about a society. It has a big impact on the dissemination and stability of artefacts; an ink drawing on paper is quite straightforward in comparison to digital media. Towards the end of our conversation I would like to try out a few category pairs on your art and would like to ask you to comment on them. A lot happens automatically, in my works as well as everywhere around us. Conscious acts have much less impact on our lives than automatic ones, which are much more frequent as we don’t perceive them in the first place. A fictional description or a descriptive fiction. Every description slips into fiction, everything is always enriched by subjective perception. Expansion takes place, lines connect into areas, so far only in planar space. At super+ CENTERCOUNT I experimented with an installation-based approach. Connecting the corners of the room with a line pattern worked well and influenced spatial perception. It appeared to me as if, due to this composition, the room was expanding at its corners. On a whim, I’d choose “abstract” and then in the same breath insist that there is more, that there is a story to tell. In regard to my works, “material” activates an association with the aspects of analogue media we discussed earlier. But regarding the content of my more recent works, I’d strongly lean towards “immaterial”. Descriptive, simply because I feel my works are very personal, or at least that the organic aspect of them is becoming increasingly important.